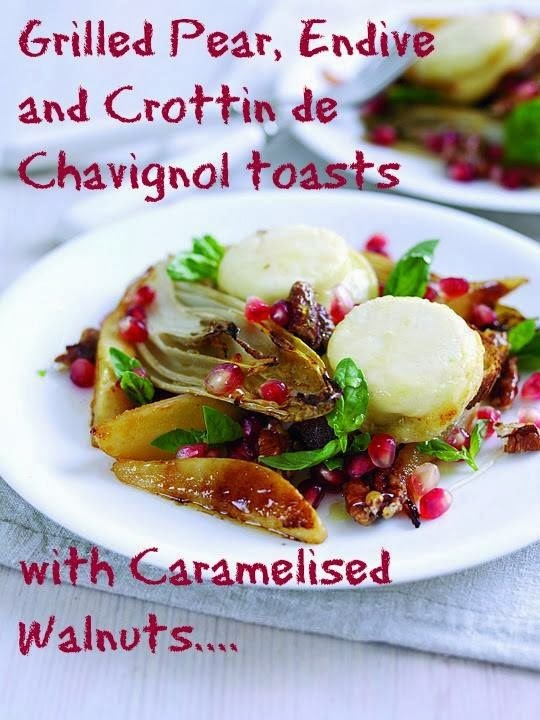 Grilled Pear, Endive and Crottin de Chavignol toasts with Caramelised Walnuts…. Heat a large non-stick pan on the stove and add in half the sugar. When the sugar starts to brown and caramelise, add in the walnuts pecans. Coat them well in the sugar them pour out on to a plate and allow to cool. Cut the baguette into 8 thin slices. Drizzle with a little olive oil, sprinkle with salt and grill, on one side only until golden. Peel and cut the pears into halves. Remove the core and then cut into 16 wedges. Cut the endive in halves and place onto a flat oven to table tray or dish, cut side up with the pears. Drizzle with olive oil, orange zest and half of the orange juice. Place the toasted slices crispy side down onto the tray, with the endive and the pear. Drizzle each slice with a teaspoon of white wine if you wish. This gives a little extra flavour. Cut each Crottin de Chavignol in half and place one, cut side up onto each of the baguette slices. Drizzle with a little more olive oil, sprinkle with salt and pepper and place under the grill for 10 minutes. Scatter the walnuts over the grilled salad, tear over a few basil leaves, sprinkle with the pomegranate seeds and drizzle with honey and olive oil. 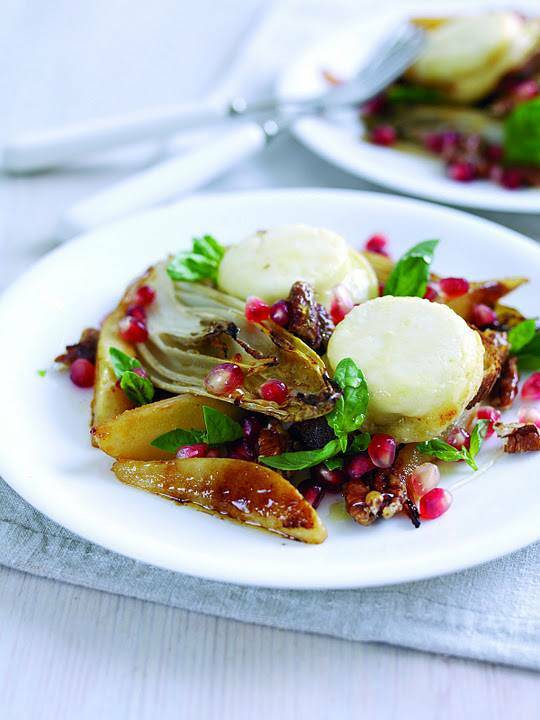 "French Goat’s Cheese Camembert Salad With Beetroot And Artichoke…"
Grilled pear?! I honestly never thought of grilling pears and I like the addition of pomegranates and walnuts too. Yum. You've officially made me hungry!